Vikramshila University was one of the two most important centers of Buddhist learning in India, along with Nalanda University. 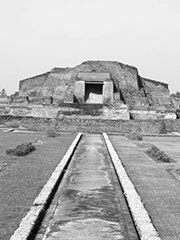 Vikramashila was established by King Dharampal of Bengal (783 to 820) in response to a supposed decline in the quality of scholarship at Nalanda. Atisha, the renowned pandita, is sometimes listed as a notable abbot. Vikramashila was destroyed by Muslim invaders along with the other major centers of Buddhism in India around 1200. Remains have been partially excavated at village Antichak in the Bhagalpur district, Bihar state, India, and the process is still underway.